A misplaced Braille dot or wrong spacing of the dots could mean something entirely for a person reading the Braille. It could mean an incorrect product name or dosage information which may have disastrous consequences for a blind person. With ManageArtworks, you can now verify your Braille component on the artworks with ease. 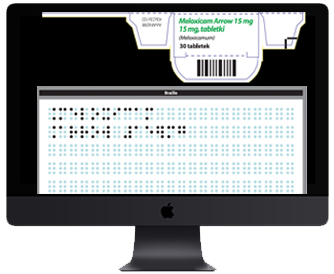 Be it Pharmaceutical Braille packaging / Cartons / Labels / Inserts, you can now proofread with ease. You can now generate inspection reports with ease as downloadable PDFs. We will help you make sure that your artworks comply with the Marburg Medium specification, as recommended by European and North American standards for pharmaceutical packaging and labels. So, How do I use braille inspection?